Bill Nye “the Science Guy” suggested during an episode of his new Netflix series that “extra kids” are a burden to the earth’s environment and that governments should consider penalizing parents who decide to raise large families. Adding that “population is one of the main drivers of climate change,” Rieder said that individuals in developed countries produce more carbon and therefore have more of an effect on the climate than people in underdeveloped nations. Referring to his own children, Rieder said that his “two kids are way more problematic” for the earth’s climate than children in Nigeria. “So, I do think we should at least consider it,” Rieder responded. “Well, ‘at least consider it’ is like, ‘do it,’” Nye stated. “One of the things that we could do that’s kind of least policy-ish is we could encourage our culture and our norms to change,” Rieder added. The remarks from Nye and Rieder drew criticism from many, including another panelist on the show, Rachel Snow of the United Nations Population Fund. 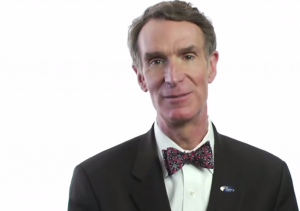 In an online review of “Bill Nye Saves the World,” the Christian apologetics ministry Answers in Genesis said that Nye’s comments reveal that he has no foundation for morality. Although Nye describes himself as “the Science Guy,” his background rather is in mechanical engineering, and he only holds “honorary doctorate of science” degrees from supportive educational institutions. As previously reported, he routinely uses his platform to promote evolution and criticize the biblical creation account.